Over the past year or so, the DC OCTO has been releasing their new web design in dribs and drabs, department by department. 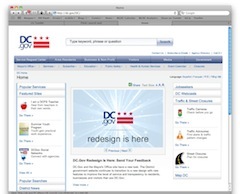 DDOT and DCRA were early high-visibility adopters, and now it’s time for the main site to take on the new look. Over the weekend, DC.gov took on the new look I like the new theme, even if their content management system doesn’t produce the most readable or pasteable URLs. Not all of the applications and pages are in the new style yet, which can be a bit jarring when you end up on one of the older-themed pages, but I’m pretty pleased with the way it turned out. Far better than the previous version, which looked like a refugee from the late 90s. Here’s hoping that the update is not merely a facelift of the old system, but includes new functionality. Most importantly, the city needs to revamp the Legislative Information Management System (LIMS) so that DC residents finally have an accurate, reliable system for tracking and reviewing legislation and votes in real time — like every other state and major city. LIMS is actually through the DC Council’s website (http://www.dccouncil.washington.dc.us/lims/), which already was redone in what I would say is a somewhat cramped format, not dc.gov. I love the new DC.Gov website. It is very clean and the design is much better!